Testing Trisha ~ Single parenting at its finest: Canvas Factory Giveaway! I was given the opportunity to do a review for Canvas Factory and received a 16x20 inch (40x50cm) canvas that I could design myself with any picture I choose! Also I will be giving away another canvas of the same size for one lucky winner to customize for their very own!! Since I do not have a recent family photo to use I went with a picture of a beautiful city view with an inspirational quote! I must say I am very happy with how it turned out! The Canvas Factory website is super easy to use, simply select "Create a Canvas" and it walks you through all the various options to customize your very own work of art! During customization there are three options as to what wrap style you would like, I chose the Gallery Wrap, which has the image continue over the side of the canvas. You can also choose a solid color on the edge or a Mirror Image Wrap. My canvas arrived nicely bubble wrapped to ensure it was not damaged during delivery! I was happy to discover the canvas already included a hook for hanging on the back! I have bought canvas prints from stores and even painted my own that did not have a hook which then requires either trying to purchase and attach a hook or simply balancing the canvas on a nail which does not always work well. I really like all the different creative options that Canvas Factory offers! 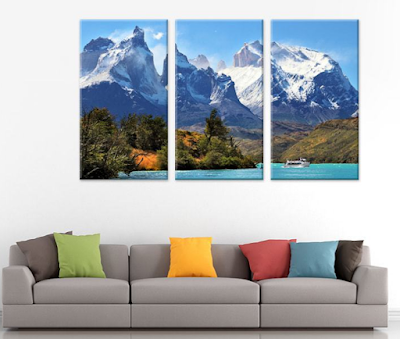 Also, its not just canvas, you can also put your favorite prints on Acrylic Glass and Aluminum! Leave a comment and tell me what picture you would like to use on your canvas. Also, Tell me how to contact you (email @where.com, Facebook @name, twitter @name) **If I can't contact you, you can't win. **This giveaway is open to US and Canada residents only. The Giveaway closes on Saturday, September 17 at 11:59 PM Eastern Time. The winner has 72 hours to respond. I will choose the winner using Random.org. Good Luck everyone, thanks for participating!!! I would use my son's first day of 1st grade picture. I'd get one of my wedding pics done. I would like to take a picture of my 4 children together...my youngest is turning 1 on Friday and it would be great to get an updated photo of them all together. I would put the photo on canvas and give it to Grandma for Christmas. She would be very excited. Thanks for the chance! I'd use a picture of my whole family! I would use a pregnancy picture of my daughter in law and son. So it could be hung in the nursery. I would just love to get a photo of my beautiful baby boy on canvas. Thanks! We recently did a family photoshoot and Ive been wanting to order a canvas of it! Love the quote you picked! Our family picture needs updated majorly, so I'd definitely use a recent photo taken on our Summer vacation in the Mountains. Also forgot my email, lol. I would love to use a photo I took of the peonies in our yard. It's a colourful photo! This would be a perfect wedding gift!